One lucky donor will receive a coveted parking spot for a week. Webster University is participating in Workplace Giving in an effort to support the Arts and Education Council again this year. The arts are vital to our region. They make St. Louis a great place to live. Whether it’s music, dance, theatre, film, literary or visual arts, the arts continue to teach and inspire us, and for over 50 years, the Arts and Education Council has been shaping a vibrant arts community throughout the bi-state St. Louis region. Show support by contributing to Workplace Giving. For as little as one dollar a week, you can provide class supplies for a summer art workshop for special needs children or ten weeks of music classes for one student. With a donation of $50 or more, you'll receive Art and Education’s ARTS card, which allows you to take advantage of special discounts on events throughout the year. You can save on tickets for Opera Theatre St. Louis, Circus Flora, STAGES, and many other events. 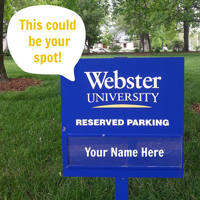 Your gift will help support the arts in St. Louis, and it will help Webster University reach its annual workplace giving goal. A gift of any amount is much appreciated. As an added bonus, at the conclusion of the campaign, one lucky donor will receive a reserved parking spot for one week on campus. To learn more about the impact of the Arts and Education Council, visit their website.